Cardiovascular mortality is remarkably high in patients who are on hemodialysis. Soluble CD154 (sCD154), a protein that belongs to the TNF receptor superfamily, has been implicated in the pathogenesis of atheromatous plaque destabilization and thrombotic events. The predictive value of sCD154 as a marker for clinical outcome in patients with ESRD was investigated. A total of 232 patients were prospectively followed for 52 mo. At study entry, clinical characteristics were documented and plasma concentrations of sCD154 and those of conventional risk predictors were analyzed. The time and cause of any hospitalization and death were documented during the entire follow-up. Survival rates were compared by Kaplan-Meier and Cox regression analyses. A total of 122 patients died, 64 of cardiovascular disease, including 20 cases of fatal atherothrombotic diseases (myocardial infarction, stroke, mesenteric ischemia). All 20 cases of fatal atherothrombotic events had high sCD154 plasma levels (cutoff >6.42 ng/ml) at study entry. The total number of fatal and nonfatal atherothrombotic events was 66. Only five atherothrombotic nonfatal events occurred in patients with sCD154 <6.42 ng/ml, whereas 61 fatal and nonfatal events were seen in patients with sCD154 ≥6.42 ng/ml (P < 0.005). This was confirmed by Kaplan-Meier curves for fatal atherothrombotic events (P = 0.0214) and the combined end point fatal and nonfatal atherothrombotic events (P = 0.0039). Cox regression analysis revealed that high sCD154 is an independent predictor (relative risk 6.80; 95% confidence interval 1.64 to 28.26; P = 0.008) for the combined end point death or hospitalization as a result of atherothrombotic events. Death or hospitalizations as a result of any other reason (arrhythmia, heart failure, infectious diseases, and cancer) were not linked to sCD154 plasma concentrations. In conclusion, sCD154 predicts nonfatal and fatal atherothrombotic events (myocardial infarction, stroke, mesenteric ischemia) but not death and hospitalization as a result of any other reason in stable patients who have ESRD and are on hemodialysis. Although hemodialysis techniques have improved exceptionally in the past decades, the high mortality of patients who are on hemodialysis represents a major yet unsolved clinical issue. Despite a widely accepted, albeit complex, set of guidelines that have been introduced in clinical practice in the United States and in Europe, outcomes remain poor (1–3). Cardiovascular diseases (sudden cardiac death, heart failure, and atherothrombotic diseases) are the most common causes of death followed by infectious diseases (4–6). Chronic vascular inflammation seems to play a pivotal role in the pathogenesis of cardiovascular morbidity and mortality in patients who have ESRD and are on hemodialysis. Particularly atherothrombotic diseases (myocardial infarction, stroke, mesenteric ischemia) are related to an activated vascular immune system in patients with impaired renal function (7–9). Recently, the CD40–CD154 system has been implicated in the pathogenesis of plaque destabilization that leads to acute fatal and nonfatal myocardial infarctions and stroke (10,11). Studies in CD154 knockout mice suggest a similar impact of CD154 for the pathogenesis of mesenteric ischemic events (12). The CD40–CD154 system represents an important amplifier of the endothelial cell responses to inflammation. CD40, a member of the TNF receptor superfamily, is constitutively expressed on platelets and endothelial cells. CD154 (previously named CD40 ligand, or CD40L), the ligand for CD40, is found on cells of the immune system (e.g., T lymphocytes) and on activated platelets. CD154 also exists in a soluble form (sCD154), which is shed from lymphocytes and platelets after cell activation. Interaction of CD154 with CD40 on endothelial cells results in increased expression of adhesion molecules such as E-selectin, intracellular adhesion molecule-1, and vascular cellular adhesion molecule-1; increased secretion of the chemokines IL-8, IL-6, and monocyte chemoattractant protein-1; and enhanced production of reactive oxygen species (10,11). Elevated levels of soluble and membrane-bound CD154 have been reported in patients with angina and after cardiopulmonary bypass surgery (10,11,13,14). Moreover, in patients with unstable coronary artery disease, elevated sCD154 levels indicate an increased risk for cardiovascular events in a 6-mo follow-up period (15). Here we present a prospective cohort study of 232 patients who had ESRD and were undergoing dialysis, with the purpose of evaluating the impact of sCD154 on cardiovascular fatal and nonfatal events. The cohort was recruited in March 2000 from two dialysis centers in Berlin, Germany. The facilities are nonproprietary units of the Kuratorium fuer Heimdialyse (Neu-Isenburg, Germany) a unique nonprofit facility. The Kuratorium fuer Heimdialyse prescribes a high quality of care pursuant to US Disease Outcomes Quality Initiative guidelines and monitors this care by means of computerized data acquisition. Patients undergo dialysis at least three times a week in 4- to 6-h sessions, a frequency that is sufficient to provide a Kt/V of at least 1.3. Written informed consent was obtained from all participants, after institutional review board approval. We excluded patients with any acute disease such as unstable angina, acute myocardial infarction, acute peripheral arterial embolism, and any acute neurologic disorder, especially acute stroke, as well as malignancies, chronic infections (such as osteomyelitis), or conditions that might affect the tested serum parameters. All patients had a functioning permanent access device. The initial documentation (and the work by Hocher et al. [16,17]) included age, gender, underlying renal disease, residual renal function and urinary output, presence of diabetes, hypertension (diagnostic criteria: need for any antihypertensive drug and/or elevated baseline BP), smoking, and presence of coronary heart disease (patients with a history of myocardial infarction, coronary heart disease confirmed by coronary angiograms, or typical stable angina confirmed by stress echocardiography or radionuclide studies). Blood samples were taken from all studied patients during March 2000, immediately before dialysis. For sCD154 measurement, blood was collected in tubes that contained trisodium citrate solution. Within 90 min, blood was centrifuged at 1000 × g for 15 min and plasma samples for sCD154 determination were thereafter immediately stored at −80°C. The patients were followed up for 52 mo, starting with the day of blood sampling. We individually evaluated all hospitalizations and deaths and reviewed the records. The times and causes of each hospitalization and death during follow-up were documented. Albumin, protein, creatinine, cholesterol, triglyceride, and D-dimers were measured by standardized autoanalyzer methods (Hitachi 747, Hitachi 911, and STA, respectively; Roche Diagnostics, Mannheim, Germany). C-reactive protein (CRP) was measured by standardized methods on an autoanalyzer (Dimension RxL; DAD; Behring, Schwalbach, Germany). Troponin T (TNT) was measured with the Elecsys System 2010 (Roche Diagnostics). sCD40 ligand (sCD154) was analyzed in duplicate using a commercial ELISA (Bender Medical Systems, Vienna, Austria). Patients who received a transplant were censored on the date of the transplantation. Change of treatment modality (initiation of peritoneal dialysis) was also a censoring event, because the effect of different renal replacement techniques on sCD154 is unknown so far. Fatal and nonfatal cardiovascular events were chosen a priori as the primary end point of the present study. Categorical data were compared by using the χ2 test. Continuous variables were assessed with t test. Cutoff values of blood parameters were determined using the area under the receiver operating command curve. When the receiver operating command curve is plotted with 1 − specificity on the abscissa and the corresponding values for sensitivity on the ordinate, the point of the receiver operating command curve closest to the upper left corner of the coordinate system (where sensitivity and specificity equal 1) represents the best cutoff value. This cutoff value was calculated and used to transform individual continuous parameters into binary end points. For sCD154, we used the lowest quintile of all sCD154 values as the cutoff value, according to one study (15). Our data were in good agreement with this recent article showing that the upper limit of the lowest quintile was a threshold for the occurrence of fatal atherothrombotic events in patients who are on dialysis (Table 1). Using this cutoff value, we analyzed survival with the log-rank tests of Kaplan-Meier curves. Cox regression analyses were performed for the end points death and hospitalization as a result of sudden cardiac death/arrhythmia, heart failure, atherothrombotic events (myocardial infarction, stroke, mesenteric ischemia), infectious diseases, and cancer. We used the two most important risk factors for all-cause mortality (preexisting coronary heart disease and TNT; see Table 2) in addition to the sCD154 variable for Cox models. We also performed Cox regression models using a priori sCD154 and furthermore the two most important univariant cofactors (detected by analysis of Kaplan-Meier survival curves) for individual disease groups such as atherosclerotic events, heart failure events, and arrhythmias. The relatively low number of covariates was chosen to consider the event rate that was observed during the study. The proportional hazards assumption (i.e., the notion that the effects of regressors on mortality rates do not vary with time) was assessed by using interaction terms for three follow-up periods. This analysis revealed constant effects of regressors on mortality rates over time. All data were analyzed by using SPSS for Windows (version 12.0; SPSS, Chicago, IL). From the initial cohort of 245 prevalent patients (16,17), 232 plasma probes were available for the current study. These 232 patients who were on maintenance hemodialysis were followed prospectively for 52 mo. Patients' characteristics and the underlying renal diseases are given in Table 3. No patient was lost to follow-up. A total of 122 (52.6%) participants died within the 52 mo of follow-up: 64 patients of cardiovascular disease, including 27 cases of sudden cardiac death, 11 cases of heart failure, 20 cases of fatal atherothrombotic diseases (myocardial infarction, stroke, mesenteric ischemia), and six of fatal bleeding diseases (intracranial hemorrhage, rupture of an aortic aneurysm). Thirty-seven patients died from infectious diseases and eight patients after malignancies. The 13 remaining cases of death were caused by various other reasons (accident, hyperkalemia, gastrointestinal bleeding, cessation of dialysis). Cox proportional hazards analysis of known risk factors that predict all-cause death in the study population revealed that TNT, preexisting coronary heart disease, CRP, and diabetes were the most important all-cause mortality risk factors in our study population (Table 2). The mean plasma sCD154 concentration was 9.10 ± 3.63 ng/ml. The cutoff for the lowest quintile of sCD154 was 6.42 ng/ml. None of the 47 patients with a sCD154 concentration below the cutoff at study entry died from atherothrombotic diseases in the subsequent 52 mo, whereas 20 of 185 patients with sCD154 ≥6.42 ng/ml died as a result of these diseases during the follow-up period. The mean sCD154 plasma concentration at study entry was also significantly higher in patients with fatal atherothrombotic events during the follow-up versus survivors (10.65 ± 2.82 versus 8.76 ± 3.62 ng/ml; P < 0.05). The total number of fatal and nonfatal atherothrombotic events (myocardial infarction, stroke, and mesenteric ischemia) during the 52-mo observation period was 66. The distribution of all and only fatal atherothrombotic events among the various quintiles are given in Table 1. Patients with sCD154 concentrations within the lowest quintile had a substantially reduced event rate. Only five atherothrombotic nonfatal events occurred in the lowest quintile (in patients with sCD154 <6.42 ng/ml), whereas 61 fatal and nonfatal atherothrombotic events were seen in patients with sCD154 ≥6.42 ng/ml (P < 0.005; see also Table 1). Death or hospitalization as a result of any other reason (arrhythmia, heart failure, infectious diseases, and cancer) were not linked to sCD154 plasma concentrations. Kaplan-Meier curves for sudden cardiac death/arrhythmia, heart failure, and infectious diseases likewise showed no impact of sCD154 on survival and the combined end point survival and hospitalization (Figure 1). Death or the combined end point death and hospitalization as a result of cancer were relatively rare events and also not related to CD154 plasma levels at study entry (P = 0.546 and P = 0.526, respectively; Kaplan-Meier curves not shown). Kaplan-Meier curves for survival and the combined end point death/hospitalization (Figure 2) as a result of atherothrombotic diseases, conversely, showed that CD154 plasma levels at study entry in stable, nonsymptomatic patients with ESRD predict both fatal and nonfatal atherothrombotic events (myocardial infarction, stroke, mesenteric ischemia). Kaplan-Meier curves, according to CD154 plasma levels, for sudden cardiac death; death as a result of heart failure and infectious diseases; and the combined end point mortality and hospitalization for sudden cardiac death/arrhythmia, heart failure, and infectious diseases. Blue lines, patients with CD154 levels of <6.42 ng/ml; red lines, patients with CD154 levels of >6.42 ng/ml. Survival rates were compared with the log-rank test. Kaplan-Meier curves, according to CD154 plasma levels, for fatal atherothrombotic events (myocardial infarction, stroke, mesenteric ischemia) and the combined end point mortality and hospitalization for atherothrombotic events (myocardial infarction, stroke, mesenteric ischemia) among patients with ESRD. Blue lines, patients with CD154 levels of <6.42 ng/ml; red lines, patients with CD154 levels of >6.42 ng/ml. Survival rates were compared with the log-rank test. Cox regression analysis furthermore demonstrated that CD154 is an independent predictor of future death/hospitalization as a result of atherothrombotic diseases (Table 4). The predictive power of CD154 plasma levels is strikingly specific for atherothrombotic diseases. Death or hospitalization as a result of any other disease is not related to CD154 plasma levels (Figures 1 and 2, Table 4). The relative risk of elevated sCD154 for future fatal and nonfatal atherothrombotic events is at least as important as the well-established risk predictors of proven preexisting coronary artery disease and TNT concentrations at study entry (Table 4). sCD154 was significantly associated with fatal and nonfatal atherosclerotic events and had the highest relative risk for these atherosclerotic events. 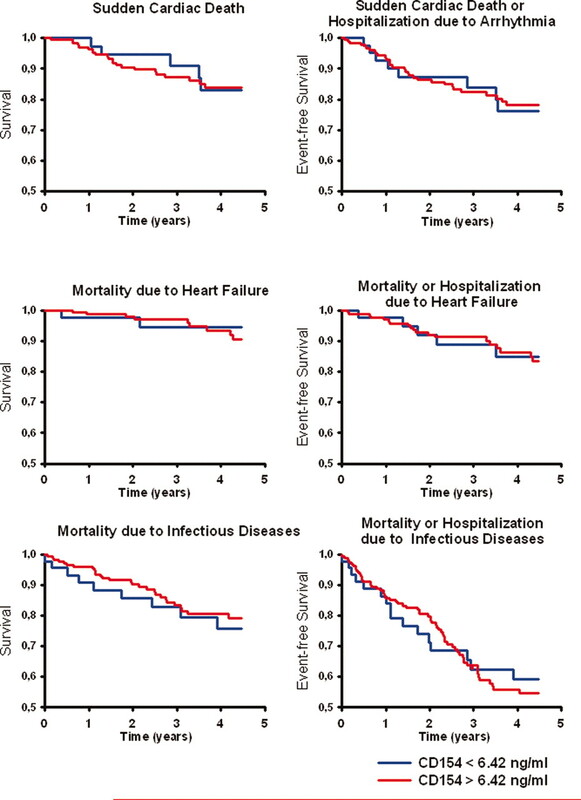 Cox regression models using the two most important cofactors (either for all cause mortality, see Table 2, and also for heart failure and arrhythmia related fatal and nonfatal events detected by analysis of Kaplan Meier survival curves) furthermore revealed that soluble CD154 –on the other hand - was not associated with an increased risk for death/hospitalization due to heart failure or arrhythmia (data not shown). Using sCD154 as a continuous parameter in a Cox regression model, we could likewise demonstrate that an increase of 1 ng/ml sCD154 in the patients' plasma at study entry is significantly associated with fatal and nonfatal atherosclerotic events (sCD145 increase per ng per ml: relative risk 1.10; 95% confidence interval 1.02 to 1.19; P = 0.014) but not with sudden cardiac death/nonfatal arrhythmias or fatal and nonfatal heart failure events. This prospective study with a follow-up period of 52 mo is the first to demonstrate that sCD154 predicts nonfatal and fatal atherothrombotic events (myocardial infarction, stroke, mesenteric ischemia) but not death and hospitalization for any other reason (sudden cardiac death/arrhythmia, heart failure, infectious diseases, and cancer) in asymptomatic and stable patients who have ESRD and are on hemodialysis. The main goal of our study was to analyze the impact of sCD154 on future atherothrombotic events in patients with ESRD. However, we were also able to confirm the effects of conventional risk factors in predicting all-cause mortality rates among patients with ESRD (Table 2). Cox regression analysis of factors that possibly were involved in all-cause mortality demonstrated that factors such as preexisting diabetes and coronary artery disease, smoking, elevated CRP levels, and increased TNT levels were predictors of all-cause mortality rates for the whole study population. These findings indicate that our study population was representative of patients who have ESRD and undergo hemodialysis and that the conclusions of our study are of general applicability (2,3,5,6,8,9,18,19). By several independent statistical methods, we were able to (1) demonstrate comparison of atherothrombotic event rates in patient with high versus low sCD154 plasma concentrations, (2) analyze mean sCD154 plasma levels in patients with versus without atherothrombotic events, (3) analyze Kaplan-Meier curves for survival, (4) analyze Cox regression models using the lowest quintile of sCD154 as cutoff, and (5) analyze Cox regression models using sCD154 as continuous parameter that sCD154 is a risk factor for nonfatal and fatal atherothrombotic events (myocardial infarction, stroke, mesenteric ischemia) but not death and hospitalization for any other reason (sudden cardiac death/arrhythmia, heart failure, infectious diseases, and cancer). It is of note in this context that the analysis of event rates among all quintiles revealed that the upper limit of the lowest quintile was a threshold for the occurrence of—especially fatal—atherothrombotic events in patients who were on dialysis (see Table 1). A comparable distribution of event rates among quintiles of sCD154 values was also reported in a study that was performed in patients with acute coronary syndrome (15). sCD154 has been recognized mainly as a marker for an acute ongoing atherothrombotic/thromboembolic disease such as acute coronary syndrome (13–15) or acute stroke (20). However, our data indicate that elevated sCD154 is a powerful predictor of nonfatal and fatal atherothrombotic events in seemingly asymptomatic patients who have ESRD and are on hemodialysis at least for a follow-up period of 52 mo. Our data are in agreement with a recent nested case-control study among participants in the Women's Health Study, a primary prevention trial that evaluated the efficiency of vitamin E and aspirin in 28,263 middle-aged American women (21). This study suggested that sCD154L is associated with increased vascular risk in seemingly healthy women. However, it is noteworthy that in patients with ESRD, we needed only 232 patients to demonstrate an even stronger effect. We suggest that two factors might explain this striking observation: First, the overall markedly enhanced risk for any cardiovascular disease in patients with ESRD (6) and, second, the widely known proinflammatory status in patients with ESRD (7–9). Both factors may amplify potential effects of the CD40/CD154 system. In this context, it is conspicuous that the blood concentrations of sCD154 in seemingly asymptomatic patients with ESRD—regardless of the outcome—are higher than reported in recent studies in patients without ESRD even with acute coronary syndromes (13–15,20,21). This is in accordance with the results of a study in renal patients published by Schwabe et al. (22). Our study indicates not only that sCD154L is another strong predictor of future nonfatal and fatal atherothrombotic events but also that sCD153 predicts highly specific atherothrombotic events but not any other event class. To the best of our knowledge, this unique combination (prediction of fatal and nonfatal atherothrombotic events combined with the lack of predictive value for any other disease in patients on dialysis) was not reported for any other biomarker. Hospitalization or death as a result of sudden cardiac death/arrhythmia, heart failure, infectious diseases, and cancer are clearly not related to elevated sCD154L concentrations (Figures 1 and 2, Table 4). Moreover, the inflammatory marker CRP predicted all-cause mortality in our study (data not shown), as CRP did in many other studies (7,8,23), but failed to predict mortality and hospitalization as a result of atherothrombotic events (Table 4). However, subgroup analysis of factors predicting hospitalization and mortality in our study showed that CRP specifically predicts infectious disease–related events (data not shown). 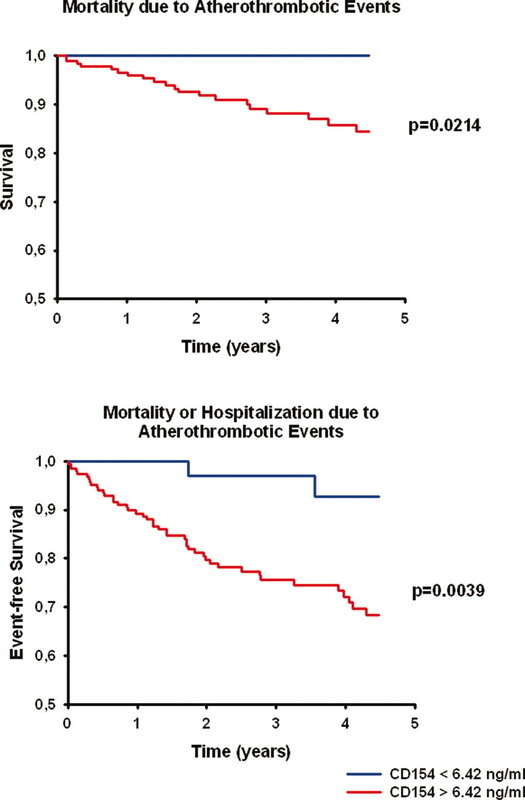 Similarly, TNT is a good marker for all-cause mortality (Table 2) but failed to predict atherothrombotic events (data not shown) in our study. Taken together, in multivariate Cox regression analysis, TNT, CRP, and sCD154 provided independent prognostic information. This is in good agreement with a study in patients with acute coronary syndrome (15). Troponins are markers of myocardial necrosis; they are not actively involved in the pathophysiology of atherothrombotic events, although TNT is a sensitive marker for the detection of minor myocardial injury. Cardiovascular mortality is extremely high in patients with ESRD. The underlying molecular pathways that explain this are only poorly understood. Recent preclinical (24) as well as clinical studies (25–29) suggested that vascular calcification plays a pivotal role in this context. Vascular calcification is often encountered in advanced atherosclerotic lesions. Calcification of the coronary arteries has been positively correlated with coronary atherosclerotic plaque burden, increased risk for myocardial infarction, and plaque instability. However, plaque instability was so far not regarded as a major player in the poor cardiovascular outcome in patients who were on dialysis. Our data may stimulate studies that address this issue in the future. Keeping in mind the physiology of the CD40/CD154 system and also considering the data presented in this study, we suggest that CD154 might be a player in and not only a marker of future atherothrombotic events that are caused by atheromatous plaque instability. This concept is supported by convincing animal studies showing that the blockade of CD154 by neutralizing antibodies as well as the genetic disruption of CD154 in mice prevent the initiation and progression of atherosclerosis and induce a more stable plaque with fewer inflammatory cells and lipids and smoother muscle cells and collagen (30,31). CD40/CD154 signaling also figures prominently in late atherosclerotic changes, such as lipid core formation and plaque destabilization (31). CD154 is a crucial mediator not only in initial events of atherogenesis but also during the evolution of established atheroma (30,31). In this context, it is important to note that statin treatment reduces CD40 and CD154 expression and lowers sCD154 (32). sCD154 is shed from stimulated lymphocytes and is actively released after platelet stimulation (33–35). This peptide is proinflammatory for endothelial cells and promotes coagulation by inducing expression of tissue factor on monocytes and endothelial cells (36,37). sCD154 may be involved in a self-perpetuating feedback loop. sCD154 binds to platelet-bound CD40 and leads to further proteolysis of platelet-associated CD154, thereby generating further sCD154 (38). sCD154 therefore reflects the activity of the CD40/CD154 system and also seems to be a player in this system. Our data might have a two-fold effect on disease management in patients who are on dialysis. Analysis of sCD154 might be a helpful noninvasive method to identify patients who are at risk or patients with a very low risk for future atherothrombotic events. However, because there is evidence that sCD154 is not only a marker of further atherothrombotic events but also is a player in the pathogenesis of plaque instability, our study might stimulate further studies with the aim of reducing circulating sCD154 levels in patients who are on dialysis (different dialysis techniques or biocompatible versus conventional membranes might have different effects on circulating sCD154). There is also evidence that specific drugs might reduce plasma sCD154 concentrations. One of the pleiotropic effects of statins is a reduction of circulating sCD154 (15,39). Clopidogrel treatment also lowers sCD154 plasma concentrations (40,41). It might be interesting to analyze the effect of statins and/or clopidogrel on plasma sCD154 concentrations and future atherothrombotic events in patients who are on dialysis as well. A limitation of this study is the relatively small sample size. This very first demonstration of sCD154 in patients with ESRD as a risk factor for fatal and nonfatal atherothrombotic events should stimulate future larger prospective studies that address this topic. This study is the first to demonstrate that sCD154 predicts nonfatal and fatal atherothrombotic events (myocardial infarction, stroke, mesenteric ischemia) but not death and hospitalization as a result of any other reason in stable patients who have ESRD and are on hemodialysis. This study was supported by a grant from the Deutsche Forschungsgemeinschaft B.H. (grant Ho1665/5-2).